Ajavain, Ajwain (Carom Seeds) is a good digestive spice, which it is used in small quantities as part of the tadka for many dishes also used in paratha, pickles, pasta sauce and much more in Indian cooking. Buy(order) Ajwain or Carom Seeds online at whole sale price from KiranaPlace, a online spice and seasoning shop. Ajwain, Ajowan caraway also known as bishop's weed, thymol seeds or carom seeds, is an annual herb in the family Apiaceae. It originated in India. Both the leaves and the fruit (often mistakenly called seeds) of the plant are consumed by humans. The small fruits are pale brown schizocarps and have an oval shape, resembling caraway seeds and cumin seeds. In Indian cuisine, it is often part of a vaghaar (Gujarati: વઘાર), a mixture of spices fried in oil or butter, which is used to flavor lentil dishes. In Afghanistan, the fruits are sprinkled over bread and biscuits. Ajwain is used as medicinal plant in traditional Ayurvedic medicine; primarily for stomach disorders. 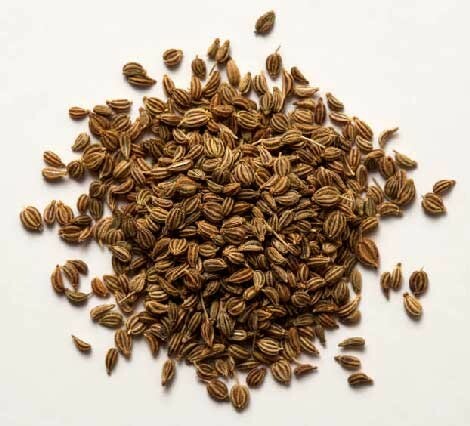 Ajwain seeds are one of the popular spices commonly featuring in Indian and Middle-Eastern cuisine. Ajwain or Carom seeds are rich in fiber, minerals, vitamins, and anti-oxidants. Ajwain seeds are the best remedy to cure digestion related problems. Ajwain seeds are very essential to cure kidney stones. Consuming Ajwain seeds with warm water give instant relief from cold and expel cough and mucus from the body. Ajwain seeds are the best natural way to cure cold symptoms such as a blocked nose. Take a steam from ajwain seeds infused in hot water for best relief. Ajwain seeds helps in excessive bleeding and irregular menses, women with this problem can drink ajwain water. Carom seeds benefits digestive problems, Chewing 1 tbsp of raw carom seeds with sugar can help you get rid of indigestion. Ajwain seeds are beneficial in case of vomiting, mouth diseases and piles.